On January 11th, 2014, a Facebook page “Stop the Mosque in Bendigo” (id: 1409152012662221) was created to oppose plans for the construction of the first Mosque in the Victorian city of Bendigo. Over the last three month we’ve watched the page grow from 4,682 supporters to over 8,000. Recent media attention has given it a boost with around 800 new supporters joining in the last week. The page has become a rallying point for anti-Muslim haters from across Australia, and to some extent internationally. Back in March we noticed how the page was coordinating a campaign of formal objections to the development. They were encouraging everyone, not just people from Bendigo, to file planning objections to the plans for the proposed Mosque and gave a catalogue of issues people should raise. The issues were carefully chosen to be relevant to planning considerations and people warned away from naked expressions of racism and hatred as that would undermine the objective. The tactic is similar to that used in the UK by a lawyer linked to the far-right English Defence League. Despite the orchestrated manipulation of the planning process, the local council approved plans for the Mosque to be built on June 18th. Outside the council chamber Councillor Mark Weragoda received abuse linked to his Sri Lankan heritage with one spectator yelling ‘we don’t want you here’. His home and work have also been targeted with black balloons. Councillor Weragoda came to Australia as a 14 year old child in 1975 and grew up in the area. He is a local businessman, former President of the local Rotary club, and a well respected member of the local community. On the other hand, the Age has reported that community leaders in Bendigo believe much of the opposition at the meeting came from outsiders associated with anti-Muslim groups who travelled to Bendigo specifically to cause trouble. Locals have also has concerns about anti-Islamic groups “hijacking” meetings that were supposed to discuss planning concerns. 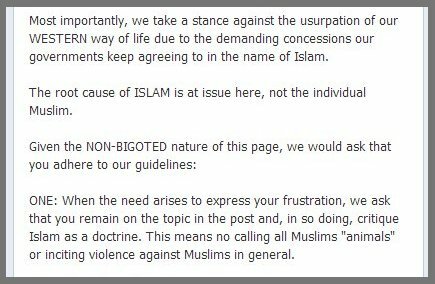 The “stop the Bendigo Mosque” page promotes the common racist idea that Muslims pose a threat to “our way of life”. At the same time it tried to present itself as being “non-bigoted” and explicitly warns supporters not to call “all Muslims animals” or “incite violence against Muslims in general”. The level of bigotry in evidence, in a post seeking to rationalise why they should not be considered bigoted, is astounding. 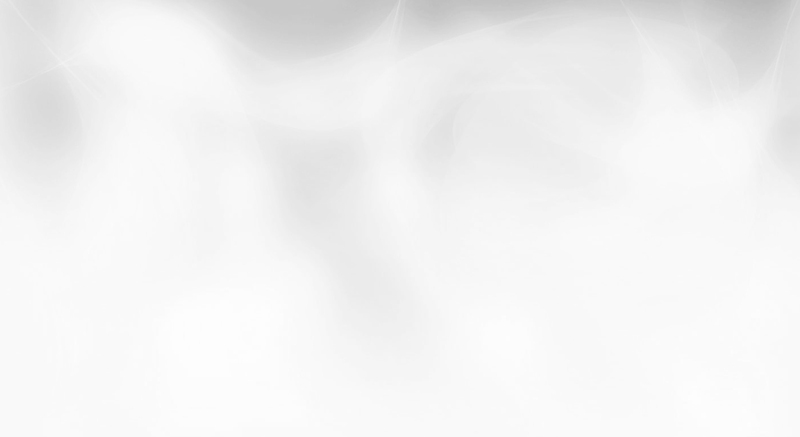 Other posts are more overtly bigoted, and in some cases openly racist. One inverted the activities of the bigots, who have been bringing people in to Bendigo to spread their hate, and claimed outsiders from the Middle East are ‘roaming around the center of town’. Such posts aim to distract locals from the influx of anti-Muslim hate mongers, while also spreading fear of Muslims in the community, making it easier for the hate mongers to do their work. As evidence by the response from Dean (from Western Australia) who advocated shooting Muslim children, the vilification promoted by a page like this can lead directly to incitement to violence. The local community is aware that much of the opposition to the Mosque, and the hate being riled up against the Muslim community in Bendigo, is coming from outside the city. The role of social media in bringing together dispersed bigots, and allowing them to focus on a local matter like this, has perhaps not been fully appreciated. Once a hate page gains traction, it’s free to focus on other targets. The “Stop the Mosque in Bendigo” page has already begun posting updates about targets for anti-Muslim activism. Legal scholar Jeremy Waldron explains that hate speech aims to send a very specific message to the wider community. That message is “We know some of you agree that these people are not wanted here. We know that some of you feel they are dirty (or dangerous or criminal or terrorist). Know now that you are not alone. Whatever the government says, there are enough of us around to make sure these people are not welcome. There are enough of us around to draw attention to what these people are really like. Talk to your neighbours, talk to your customers. And above all, don’t let any more of them in” (Jeremy Waldron, The Harm in Hate Speech, pg 2). This is very much the message that is being promoted by the bigots. A few of them are local, but the vast majority are not. Through Facebook, and through visits to Bendigo by groups like the Q Society, they have created an impression that this message is mainstream and accepted in Bendigo. Recent moves by locals in Bendigo opposing the hate and reclaiming their city, for example through the coloured balloon campaign, are exactly the right response to this exporting of hate into regional Victoria. 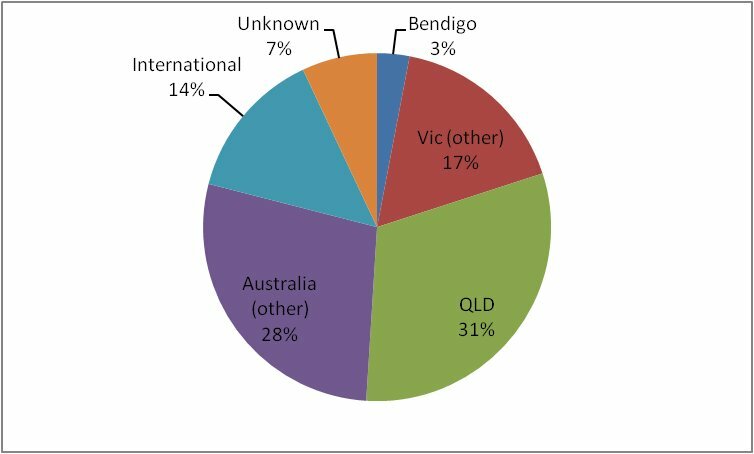 Our analysis of the “Stop the Mosque in Bendigo” page shows that the percent of supports from Bendigo itself is tiny. In our sample of 100 users who had recently engaged with the page, only 3% were from Bendigo. Victorians (including those from Bendigo) made up 20% while those from other Australian states and territories collectively made up 59% of the sample (over half of them from Queensland). 13% of the support was from outside Australia altogether. This analysis strongly supports the impression many locals have had, that the opposition to the Mosque was something being foisted on Bendigo by outsiders with their own agenda. This tactic is new to Australia, but common in the United Kingdom and the United States. Social media is an enabling technology, and the power of this technology should not be available to groups which aim to manipulate our democratic processes, incite hatred, and put people’s safety at risk. 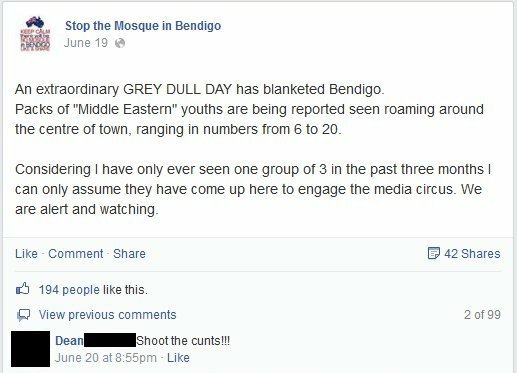 The “Stop the Mosque in Bendigo” page should to be closed by Facebook before it can do further harm.